On March 3 and 4, the Wisconsin Women’s Network hosted a training weekend for 90 advocates, mentors and organizers working to improve public policy for women, work and families. Saturday afternoon included a round of TED-style talks on lobbying, using data and stories for advocacy, and how to leverage the power of social media for good. In my talk, "Sisterhood is Powerful on Social Media," I wanted the participants to understand that while social change requires awareness before action (doesn’t everything have its own awareness day now? ), they each have incredible potential to be influencers as policy experts in their own communities. They should raise their own public profiles as go-to leaders, experts, well-resourced and well-connected people who are making a difference. It’s that top-of-mind awareness of who they are as leaders that was inspired by "ROTOMA: Return on Top of Mind Awareness," a book by Spencer X. Smith and D.P. Knudten. Their book, talks, and podcast are packed with ideas on the value of using social media to stay top of mind, but I only had time to share one fun strategy. I strongly recommend reading more about #ROTOMA. Big thanks to the Wisconsin Women’s Network for inviting me to speak. Social is scary - Can we agree that sometimes social media feels like a waste of time? It can be overwhelming, depressing or even threatening to our privacy. Social is powerful - But we could also agree that today’s most important social movements are being advanced through the use of social media. #MeToo, Black Twitter, Standing Rock, Wisconsin’s 2011 Capital protests, #NeverAgain against gun violence and more – are powerful examples of the incredible momentum, changing attitudes and community building that comes from using social. How can we harness the power of social media for good and raise the profile of our causes by spotlighting our amazing partners? First, can we also agree that if your goal is awareness – of your cause, campaign or company – that it is better to be at the top of people’s mind than forgotten? Isn’t it an advantage to be the first person who comes to mind when people think of an expert, a community leader, an advocate on an issue or someone running for office? The social media measure of success that is sometimes hard to measure is the return on the investment of time to say top-of-mind with your audience. Local business development guru Spencer X. Smith and marketing Yoda D.P. Knudten literally wrote the book about how to do this. In ROTOMA: Return on Top of Mind Awareness, they explain a very positive, uplifting philosophy on exactly how to carve out time to use social for good. One strategy – the unselfish selfie. (As a Midwestern woman, I think we are disinclined to brag about ourselves… but...) We can choose to brag about the people we meet, work with and admire. The next time you are at a meeting, conference, training, protest, campaign rally or even a friendly brunch with someone you want to spotlight, take a selfie photo or video with them and post it to social media and explain why they are doing good work. When is the unselfish selfie an act of powerful sisterhood? When you spotlight women, people of color, wise retirees, wise youth, people with visible and invisible disabilities, queer and trans people, and those fighting for economic justice, you are lifting up unsung heroes and leaders who deserve recognition. By sharing affirming and uplifting posts, you remind your audience you exist AND know amazing people. You stay top of mind. And you are actively building a network of positive, supportive, grateful support along the way. I created the second of a two-part audio story on The Megaphone, a workshop series sponsored by Sustain Dane and MG&E's Living in Balance. Read more about this innovative community building initiative in my previous audio story blog post. Going into this project and after having an initial meeting with Sustain Dane, I didn't know exactly what the outcome would be. I knew I had an opportunity to produce something creative and have it air on WORT-FM, Madison's community radio station where I write and read the news on Thursday nights. I knew what Sustain Dane was working on was special and documenting the process somehow could help them explain the value of connecting a diverse group of local people with storytelling skills and encouraging them to talk about their own stories of sustainability. This project shifted a bit and we all shifted with it. Even the weather was uncooperative and a snow emergency led to rescheduling this second workshop. A shift in schedule impacted the content of the second story which would air on the radio the night before the series culminated in a Story Slam at a local coffeehouse. Listening to the workshop participants talk through the plans for the Slam, I recognized that the event - while at a public space that had open hours - some participants were a bit nervous about performing and weren't looking for a ton of publicity. My story promoting the Slam had to change. I'm glad the final outcome turned out well and that I got to talk one-on-one with Cara and Gloria. Those quotes made the story stronger. I absolutely hope Sustain Dane tries this model again and I hope storytellers like Jen Rubin and Takeyla Benton get to work with more nonprofits to teach these skills. The second Megaphone audio story is also available on the WORT-FM website. MG&E's Living in Balance was at the Story Slam to capture the event on Facebook Live. I met with Sustain Dane staffers not knowing exactly what I wanted to do to help document what they are doing with The Megaphone project. I only got a press release forwarded to me by Molly Stentz, the news director at WORT with a message that I might be interested in covering the events. Through some discussion and a few emails, I committed to showing up to their first workshop on January 22 and recording what happened, then turning that into some kind of a feature story for WORT's Local News. What I learned, however, is that by being a person who is documenting the why and how of an event rather than just being a participant, I gained more than I gave. The Megaphone is a three-part event where community members are invited to learn about the mechanics of composing and telling a story out loud, practicing their stories, and then performing their stories in front of people in a room. And because it's sponsored by power company MG&E's Living In Balance initiative and Sustain Dane, it all revolves around the idea of sustainability. These partners are doing this really interesting, hands-on work to get people talking about how the health and future of our city depends on people making sustainable choices for themselves and for each others' benefit. It's deep work, but it could be a model to watch and replicate. The first audio story was on WORT's Local News on January 25. This was my first ever audio story and I'm pretty proud of finally getting a chance to try to create something that sounds like the countless, compelling pieces I've listened to on public radio since I was a teenager. There is this often-circulated quote by Ira Glass about the gap between the stuff you make when you start and the future attainment of mastery and taste you're striving for. This audio story is far from perfect and there are things I would have changed even seconds after I hit "send." But every time I do something with audio recording and editing, I get better. Sustain Dane held their annual Badger Bioneers event where they inspired people to think broadly and creatively about what it means to nurture a truly sustainable and healthy community. I crashed their afterparty to volunteer and take some photos. Sustain Dane will be sharing video and more photos of the full day soon, but I'm glad I got the chance to snap some pictures and chat with some of the incredible people who are doing great work in Dane County. Learn more about Sustain Dane on their website. 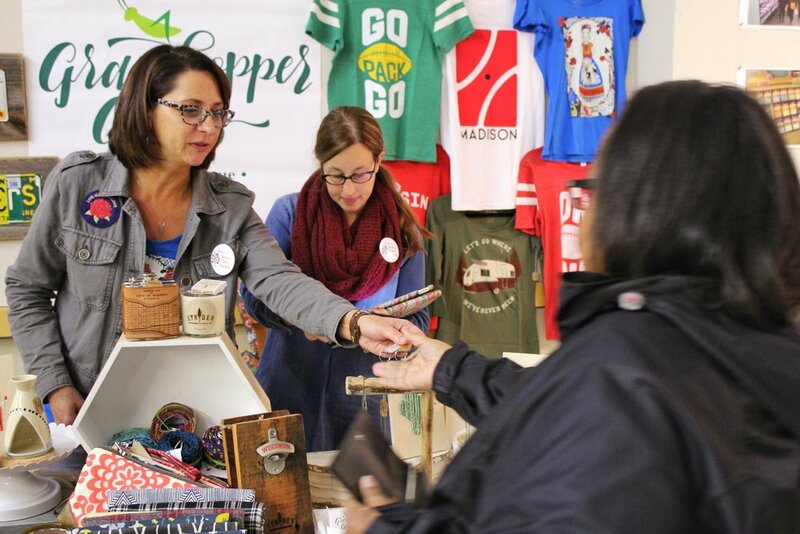 On October 11, the Friends of the Madison Public Market hosted over 600 visitors in a lovely space off East Washington where 20 merchants and artists shared the first taste of what we can expect from the future of this very promising project. I volunteered to take some photos of the event and had a blast grabbing some shots of the vendors talking to their visitors and even some odd photos I hope the Public Market organizers can use in future marketing materials. Every time I take photos at an event, I learn something new about photography. And usually add some new gear to my wish list (hello wide-angle lens and monopod!). More photos are available on the Friends Facebook page. Please like the Friends of the Madison Public Market on Facebook or sign up for their email updates to keep abreast of this innovative project. Yesterday I attended NonFiction Branding with DP Knudten and got a great lesson in marketing. I came because DP - a self-proclaimed "high-functioning introvert" - just came up to me and invited me at the last Social Media Breakfast. I'm so glad he did. Another AmFam Dreambank workshop teaches and inspires! His talk takes you a little deeper behind the age-old wisdom that a picture is worth a thousand words. He makes the case that your brand is worth even more than that, especially once you’ve gotten to the heart of the truth of what your company or nonprofit is all about. · He discussed why “authenticity, refreshment and sociability” are the founding concepts of Coca Cola’s brand and are what makes it so valuable, despite having dozens of taglines and countless campaigns over the years. · He helped us take a new look at how Johnson and Johnson put their founding credo to the test in the 1982 cyanide-tainted Tylenol crisis; the company stayed honest and true to their mission rather than hiding and doing the minimum. · Even what seems like a casual interview with Michael Kors on CBS Sunday Morning became a case study in how a company’s leader nails his brand’s three key elements that make it so successful. Fortunately, his talk wasn’t just about huge corporate marketing campaigns. DP offered an excellent example of how a nonprofit that was struggling with an outdated and ill-fitting name took the leap in rebranding to a new name that inspires hope. The National Transplant Assistance Fund (a group that did more than help with organ transplants… and didn’t directly fund people) transformed into Help Hope Live. The shift gave their board a literal statement of hope to fundraise around. To be honest, I usually roll my eyes at organization names that are more of a sentence than a name. But DP told such a compelling story about Help Hope Live that I wondered why all nonprofits don’t do this. Further, Help Hope Live reaped the benefits of their improved and more honest rebrand. A 30% spike in donations reflected how people absorb a nonprofit’s mission first through their heart, then their head, and then they act with their wallets. This applies equally to nonprofit and for-profit entities. But if the brand isn’t honest or doesn’t reflect who they really are to begin with, that heart-centered storytelling is harder. Not impossible, but harder. Probably the most valuable thing that DP hammered home was the idea that your honest brand is a truth that is deeper than mere opinion. In anything that exists to represent your brand – it could be a logo, a press release or how you answer a journalist’s call, a blog post, a Facebook event page cover image or maybe tweets from your executive leadership – don’t get bogged down in bickering over what people personally like or don’t like: this shade of purple or that size of font. The only question that matters is if it truly represents your brand and who you really are. DP wants people to think about the three key concepts that are the foundation of their brand. These are what he calls the timeless keystones that define what you’re all about and what people will remember long after the color-and-font argument is forgotten. He even gave us homework to help us develop these concepts further. If you’re working on your small business or if you’re exploring the whole idea of personal branding, he can help lead you through a process of understanding the value of a brand and what yours is truly about. Learn more about his work at Collaborator Creative. On June 14, 2017 Sustain Dane hosted a WOW Bike Tour during their Week of Wins which showcased some of our community's sustainability victories. It was a great event for me to practice photography. It was a lovely, intergenerational learning experience and we all got some exercise and delish Ian's Pizza too. Lucy, Sustain Dane's Communications Manager said about the photos, "thank you so much. We're so excited to put them to use, and we appreciate your support and skills in capturing so many great moments!" There are lots more photos of the event on Sustain Dane's Facebook page. Making our way to Ian's Pizza! This is Unstuck's Stacy. Who needs a GoPro. At the last DreamBank business accelerator workshop I attended with George B. Thomas, I heard an announcement about a talk with Miri Rodriguez, Storyteller with Microsoft. As with most social media marketing workshops that are geared for business development, I was prepared to do what I always do: translate the basics in my head to apply to nonprofit communications work. But Miri’s talk on storytelling was so applicable to nonprofit communications. That’s because all of the nonprofits that I most admire are putting human impact stories at the center of how they talk about their work. Even the Dane County Humane Society and the River Alliance of Wisconsin aren’t just talking about pets and rivers: they are telling the stories of people. At the DreamBank talk, Miri explained how Microsoft welcomes the stories of people who are using Microsoft products to accomplish some kind of achievement. In Microsoft’s storytelling, achievement is very subjective. She said that people talk about their achievements in themes of movement, heroism, betterment and destination. But because Microsoft’s storytelling series has a clear mission and clear story guidelines, they are able to welcome stories that fit their vision which helps them share examples of how people are using technology for good. Some of the most successful and moving stories are ones where people may be vulnerable, but overcome great odds. She used the example of Ariela Suster’s story – watch the video online. Ariela will be coming to Madison and you should absolutely come to that. They are already talking about you. Engage them. Miri also made the point that people are already talking about your organization. You might as well capture how they relate to you, what they think of you, and then share their stories. How can you learn what inspires them and can you ask them to talk about that to you? That’s the start of the story, whether it’s people who benefit from your service or who believe in your mission or who donate to your organization. I also attended a meet and greet at Synergy Coworking that was organized by Araceli from @WI_MUJER. The big takeaway for me was that all stories have value. Achievement can truly be about moving towards a goal or starting on a journey toward a destination. I’ve had conversations with people recently who don’t believe they have anything good to share via their personal brand or on social media… but you don’t have to be an expert. If you are learning as you go, share what you’ve learned with others who are just starting out. Miri’s mentee learned that her story has value and people benefit and grow from learning about her “started from the bottom, now I’m here” experience. Throughout her visit, Miri emphasized that you can’t fake passion. Transparency is the basis of authenticity and you can’t fake that either. Don’t be afraid to be vulnerable because that is where your humanity is and that’s how you can connect deeply with others. Don’t be afraid to admit what you don’t know or what you are learning either. That’s a big part of what you have already overcome to get where you are now. Your story matters. The people at the heart of your nonprofit have stories that matter (working on dry public policy? Look for the people and show the human impact. Your donors have something to share too). If you are trying to explain your mission or tell the stories of your nonprofit’s impact and it seems boring, go back to the drawing board. Go back to that transparency and find the authenticity of the human experience. That’s where the real story is. Miri's presentation is now available online. Go watch it and get inspired. How fun is this? My day-in-the-life story was posted to Kivi Leroux Miller's Nonprofit Communications Blog! I think it really reflects my typical/ideal day at work. I read some of the other blog posts in the day-in-the-life thread and it's fun to peek into the routines of other people who do the kind of work I do. But I thought the stories missed an element of sharing details on the daily tasks that keep us on track to accomplish larger goals of our mission-driven work. We all have to check email - but we also have to keep track of media mentions and build relationships with journalists, reflect on our victories in quarterly reports, read and share our collaborators' social media posts, and make time to hone our skills and plan for the future. Taking your brand from zero to hero: What George B. Thomas built. What do people who make their personal brand stand out have in common? What makes leaders in the social media realm make a difference? This week, George B. Thomas broke it all down for an audience at the Dream Bank in Madison. George is an interesting guy. In fact, he shared a lot of the defining moments of his life that made him who he was. He was a high school dropout who ducked death on a Navy ship and experienced a motorcycle accident that taught him what humility meant. George’s vulnerabilities and willingness to expose his own faults underlie his philosophy that who you are is your honest brand, flaws and all. But as with many social media marketing workshops that are geared for for-profit companies, I had to do what I always do: translate the basics in my head to apply to nonprofit communications work. Sometimes it’s hard. Truth: I had to google what “inbound marketing” meant. It’s sales jargon, but it essentially means drawing people in, explaining who you are and what you’re worth, and enticing them to engage with you. It’s what nonprofit communications folks do every day, even if we don’t think of ourselves as inbound specialists. - Don’t be afraid of being vulnerable – you’re putting yourself out there each day you tweet or post or snap. And even if you aren’t an expert at what you do, it’s ok. You learn as you go. You can share what you are learning with others and they will learn from you. In the nonprofit communications world, that might mean not waiting for perfection and a mastery of a social media platform to use it. Experiment! Maybe your first Facebook live post looks really bad. But keep trying. Learn and adapt. It might also mean revisiting your organization’s crisis communications plan. The best examples of crisis responses are when organizations (or companies and public figures) own up to their mistakes and take quick action to make it better. In case you missed the recent post on the Nonprofit Quarterly blog about how White House spokesman Sean Spicer is an example of what NOT to do, it’s tongue-in-cheek but true. - Your Executive Directors have a brand too (whether they like it or not) – In the same way vanguard companies have Captains who steer their ships (Bill! Mark and Sheryl! Steve! ), your executive director and your most public-facing staff also have a brand. Their brand can matter, if they choose to use it. It’s the communications staffers’ jobs to put their leaders’ opinions and perspectives out there in a way that makes a difference. Whether you work on environmental issues or child welfare and public schools or the arts… your director’s opinion about the root causes of social problems or lack of access to resources or the reasons for injustice can influence the public debate. Help them think about their brand and how they can use their influence. - All of our community’s social media influencers have these things in common – From being vulnerable enough to experiment and make mistakes, to learning as they go and teaching others, to collaborating and supporting each other (even with a friendly retweet or like), the things George outlined are all things our community’s leaders have in common. I follow Josh from Reverbal Communications @ReverbalC, Chelsey from designCraft Advertising @ChelseyHelen, Andrew @andrewfoxwell and Gracie @GracieFoxwell of Foxwell Digital, Don Stanley @3rhinomedia and Spencer X Smith @spencerXsays who are just a handful of people in Madison who are leading the social media marketing community. Who are the Madisonians who you follow for social media marketing inspiration? Tweet your suggestions @UnstuckComm. Good nonprofit communications influencers is a whole other blog post for the future. George's full presentation is now available on AmFam's Dreambank website. Check it out and let me know what you learned! Tweet me @unstuckcomm and be sure to tag George at @GeorgeBThomas. The talk on Tuesday at American Family’s DreamBank was a part of the company’s business accelerator program. Worth a look, especially for anyone who is a solopreneur or a small business owner. Learn more about Hubspot accredited trainer George B. Thomas on his website or @GeorgeBThomas on Twitter. REAP Food Group staff are so amazing. REAP Food Group recently published their annual report covering work in 2016. I was happy to volunteer and take their staff photo. Download a digital version of their annual report from REAP's website. REAP Food Group is a great nonprofit organization that connects food producers, consumers, businesses and restaurants and even schools to grow our local healthful, just and sustainable food system. They are a driving force in the movement to get healthier food options for kids in our schools and they are a go-to resource if you want to know which restaurants are serving locally-sourced food. I took this photo on the top floor of Madison's downtown public library. As someone who is new to digital photography, I always learn new things every time I pick up a camera or work with people. This was a great experience and I learned how to communicate with a group to get them posed, how to work with natural light, experiment with manual and auto settings and how to make adjustments in color and editing in post-production. Even a few months after taking this photo I have a better understanding of how to use my camera to improve this shot (moving the f-stop up a tick may have allowed the last person in line to be in sharper focus), but I'm proud of this photo and am honored that they used it in their publication. Please support REAP's work! Donate online or choose to give through your workplace's Community Shares of Wisconsin giving campaign. Here is a sample of my radio work. In this link, you can hear me read the headlines and introduce feature segments along with my co-host, Marcus Slayton. My volunteer service includes writing the headlines and working with a small team of producers to edit and finalize the script. I've been so grateful to have been able to volunteer at WORT- FM in many ways over the years, but I was recently reminded why being a co-host of the Local News on Thursday nights has been particularly special. In 2016, I promised myself that I would do a little yoga every morning and write down something I was grateful for every night. I recently read my scraps of paper with gratitude messages on everything from chirping birds to meeting my partner and attending a mind-blowing yoga retreat. A slip from January noted my gratitude for WORT's news made me realize I've been reading the Local News on WORT for over a year now. The experience has been so valuable to me. Volunteering involves writing on deadline (I get 50 minutes to read and summarize five news stories of the day), reading a script on live radio (and keeping your cool no matter what is happening in the studio or in last minute changes in the script), and working on a team with fellow news producers, volunteers and my bass-voiced co-host. Volunteering is keeping my writing skills sharp and live radio has a tiny adrenaline rush that's way safer than bungee jumping. No show is perfect, but this one was fun to do. Well into 2017, I'm still grateful to be reading the news.